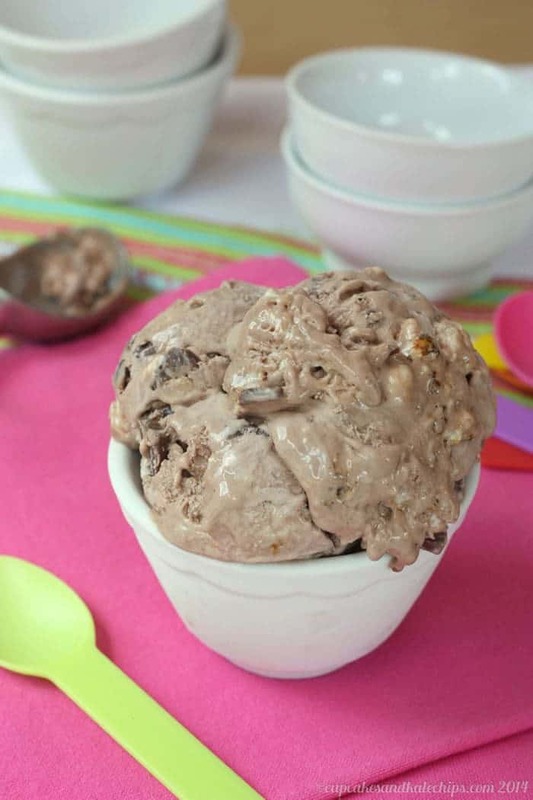 A simple no-churn ice cream that tastes like brownie batter, and is swirled with gooey roasted marshmallows and pieces of your favorite chocolate. Brownie batter no-churn ice cream with chunks of chocolate and toasted marshmallows swirled throughout! 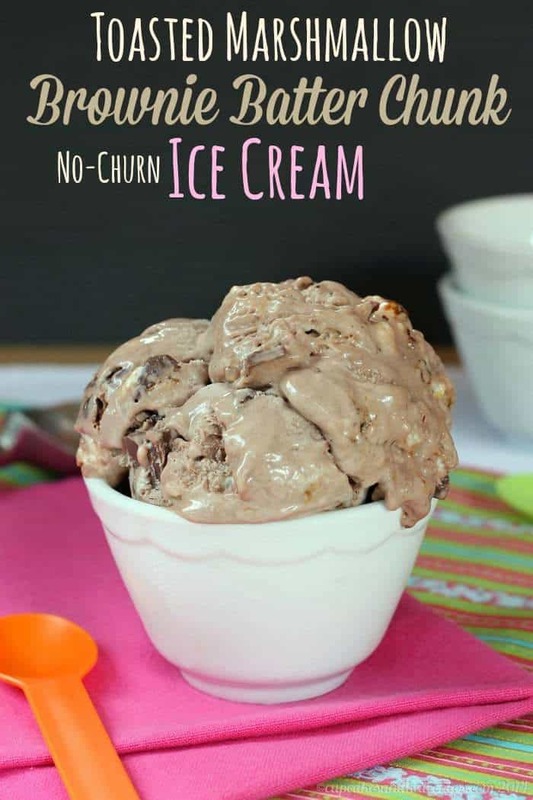 This easy no-churn ice cream recipe combines 3 favorite desserts – brownies, s’mores, and no-churn ice cream, into one homemade frozen dessert! What’s better than licking the brownie bowl? How about turning the brownie batter into a no-churn ice cream, swirled with gooey roasted marshmallows and pieces of your favorite chocolate? 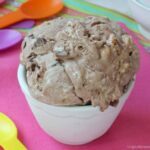 And you can easily make this a gluten-free brownie batter no-churn ice cream! 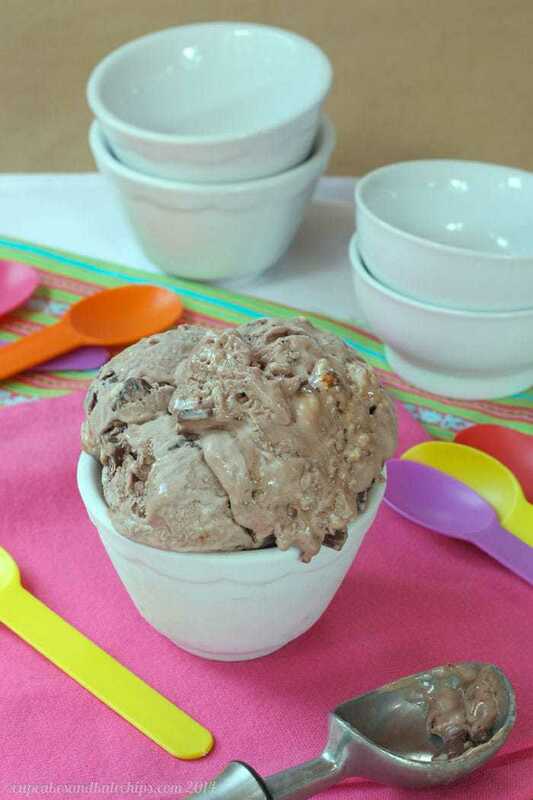 Forget the s’mores and make Toasted Marshmallow Chunky Brownie Batter No-Churn Ice Cream. I can’t believe we’ve reached the end of this epic week of ice cream. You didn’t miss any of the creamy, dreamy goodness, did you? I didn’t have a recipe on the first day, but TWENTY-ONE of my friends did! 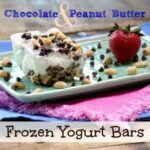 On Tuesday I gave you Nutella Swirl Toffee Crunch No Churn Ice Cream, and that was pretty flippin’ fabulous, plus another TWELVE frozen treats from my bloggy buds! Wednesday was an off day for me, but one of our lovely hostesses, Susan, not only has this amazing Cherry Almond Chocolate Semifreddo, she also gives you links to yet another EIGHTEEN ice cream recipes. On Thursday, not only were there SIXTEEN more sweet treats, but I made some adorable and super yummy Flourless Chocolate Almond Coconut Ice Cream Sandwiches. And yesterday had yet another FIFTEEN frozen fabulosities, PLUS this gorgeous Roasted Blueberry Cheesecake Ice Cream from the amazing Kim, our other hostess. You know what else I can’t believe? I posted desserts all week, and not one of them contains peanut butter. That’s like totally unheard of in this house. But who needs peanut butter when you have this Toasted Marshmallow Chunky Brownie Batter No-Churn Ice Cream! Holy shazowie, people! 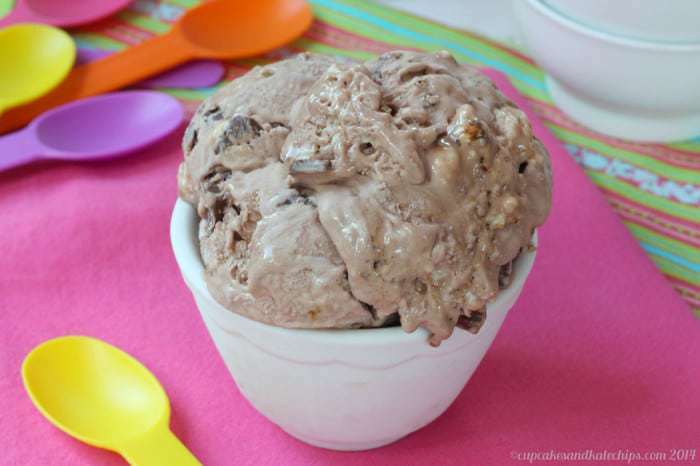 This Toasted Marshmallow Brownie Batter Chunk No-Churn Ice Cream is absolutely incredible. No-churn ice cream is already super rich and creamy. Then I went ahead and made it taste like you’re licking a brownie batter bowl. Except it’s ice cream, which only makes it better. Then I went and did one better, toasting marshmallows under my broiler and mixed them in to create a sticky swirl of goo. But wait, there’s more. Chocolate! Because I have to have texture in my ice cream, I added chopped up chocolate bars, in this case, milk chocolate Hershey bars, to make it sorta s’mores-ish. Only even yummier because, again, brownie batter no-churn ice cream. You’re following along, right? Or are you already delirious at the thought of this awesomeness? Just wait till you taste it! I die, people. I die! So grab yourself a few scoops of brownie batter no-churn ice cream! While the bowl is chilling, preheat your broiler. Coat a piece of aluminum foil with cooking spray and place the marshmallows in a single layer. Place the marshmallows under the broiler for 2-4 minutes, or until browned and toasted. Remove from the oven and set aside to cool to room temperature. In the chilled bowl, using an electric mixer or whisk, combine the heavy cream and brownie mix, and beat to soft peaks. Gently fold the sweetened condensed milk into the whipped cream. Break up the marshmallows on top of the cream mixture, add the chocolate chunks, and gently fold in. 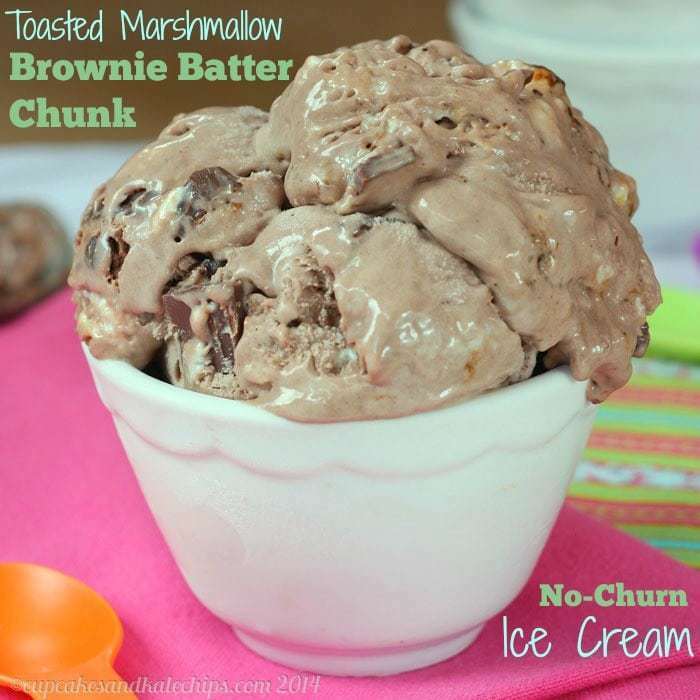 Toasted Marshmallow Chunky Brownie Batter No-Churn Ice Cream, from me! We would like to thank you all our readers for joining in the indulgence this week. Ice cream is always best eaten with friends. Kim and Susan would like to thank all the participants and sponsors for joining in the fun. It’s take a village to make this much ice cream! See you all next year for Ice Cream Week 2015. Be sure to stay tuned for news about Cookie Week in November and Christmas Week in December. Susan and Kim are always up for fun and food. Ciao! And if all of these amazing ice cream recipes aren’t enough, now you get to win an amazing prize pack to help you churn up a ton of your own! Remember – ONE WINNER TAKES ALL! Update: The giveaway is over and the entry form is no longer in this post. I just got home from the grocery store, but you have me wanting to go straight back to get all these ingredients. My mouth is watering!! This looks so yummy! No I want some ice cream. 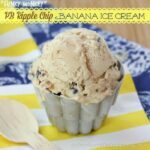 Finally a ice cream recipe that you don’t need a machine for! No-churn ice creams are the best! What a fabulous combination! This looks delicious, pinned! omigosh. I mean….so much happening here. Those swirls of toasted marshmallow totally take it over the top! The marshmallow really makes this ice cream! Thanks Kayle! Do I have to pick just one? Probably a good, dark chocolate… but I pretty much like them all. I wish every week could be ice cream week. This ice cream is the bomb!! Pinned! I agree, but my pants beg to differ 🙂 Ice cream is my weakness! Thanks Dorothy! definitely craving a scoop of this ice cream right now.. looks and sounds so delicious! I am too. Wish it hadn’t disappeared awhile ago! I love marshmallow with my ice cream, I always have! Love that this is a no churn ice cream! Marshm,allow is great, and I love the toasty flavor by putting them under the broiler. OMG, you make delicious looking ice cream girl!! Another home run!!! Haha, I think being an ice cream addict helps! That combines all of my favorite things! I’m trying this the second I get back to the states! It is a perfect combo! This ice cream looks so rich and luscious!! LOVE IT! Oh yum toasted marshmallows and brownie together? 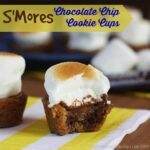 I bet it takes like a brownie s’more all it needs it graham crackers! Mmm, maybe make an ice cream sandwich using graham crackers! My favorite ice cream is Ben & Jerry’s Cherry Garcia, but pretty much anything with chocolate works for me. I can’t wait to try this! Have you told you how much I want to swim in this? I am so thrilled this week happened. And that you joined us. Let me tell you, I’m so happy I only made a half batch! Thanks for all of your hard work! I’m glad I was able to pull the recipes together in time to join in! Cherry vanilla is my favorite flavor! My favorite ice cream flavor would have to be buttered pecan. Yum. I will have to try this. It looks so good. I want to lick my computer. I appreciate how you like texture in your ice cream, because my eye catches on the chunks and bits and just starts watering along with my mouth. Delicious! Thanks Kirsten! I know some people like perfectly smooth, creamy ice cream, but those bits and swirls just call my name!